Cranky Fitness: Should Restaurant Menus Fess Up To Calories Counts? Should Restaurant Menus Fess Up To Calories Counts? So it was big news last summer when New York City started requiring chain restaurants to post calorie counts on their menus. There was much outcry amongst folks who felt such government regulation was intrusive, and cheers from health advocates who argued that such regulation was necessary, given the rising obesity rates, diabetes risks, etc., etc. Skeptics have said these kind of laws won't help anyway, because people don't want the information and are just going to ignore it. Now that the requirement has been in place for a while, guess what? Intrusive or not, these regulations seem to be working. Calorie counts at restaurants are providing consumers with information they didn't know, and even changing the way they behave. Note: I couldn't find a handy-dandy link to the survey methodology--so it could be an itty bitty survey done by someone's fourth grade class, or a great big survey done by serious scientists. I have to confess that discovering that there is anything that 86% of New Yorkers agree on is a bit of a shock. Other cities are also enacting or considering such legislation, so we may see more of this in the future. Do you have an opinion on whether restaurants should be legally required to post calorie counts? But there are pro's and con's to regulation--and of course I'd love to know what you folks think. Here's my take on the advantages and disadvantages of making restaurants display calorie information. 1. It's a Free Country! Generally, rather than require business establishments to do something that's good for us, it's nice if you can let the market decide to do the right thing on its own. This is an especially appealing argument if you think individuals are smarter than governments, which a lot of people do. So in theory, if enough people want restaurants to provide calorie listings, then more people should patronize restaurants that have them. And then the restaurants that serve gargantuan 20,000 calorie dinners without telling anyone how bad they are for you will go out of business! (Tee hee. Giggle giggle. Laugh laugh laugh snort guffaw). 2. Focusing on Just Calories Is Misleading: Our health problems are only partly due to high-calorie/low exercise lifestyles. It's WHAT we eat that gets us in trouble. A big healthy meal full of fruits, vegetables, protein, fiber, and good fats may have more calories than an ice cream cone--but there are folks dumb enough to look at the calorie difference and feel like they're taking the high road by getting ice cream instead of lunch or dinner. 3. Don't F-ck With My Birthday Dinner. Some people dine out only on special occasions, and otherwise eat wisely and moderately. For these folks, having a menu rub one's face in the fact that a "Bloomin’ Onion" appetizer at Outback Steakhouse has over 2,000 calories could totally spoil the mood. There are definitely times when we Don't Want to Know. 4. The Information Is Out There For Those Who Want It. Those of us who actively try to avoid eating high calorie, fat-and-sugar packed Giganto Meals tend to avoid the sort of chain restaurants that are famous for them. But if we do decide to go, we tend to: (a) use common sense, (b) ask if they've got a pamphlet with nutritional information, or (c) look on the web ahead of time to a site like Calorie Lab, which has a huge compilation of nutritional information. (Calorie Lab is also the home of one of our favorite commenters, Dr. J.). People who care enough to educate themselves are less likely to "accidentally" eat a 4,000 calorie dinner. 5. Calorie Counts Are Often Wrong. In real-life tests, it's been shown that often restaurants under-report calories of their supposed "healthy' meals. And it's not necessarily just to be Evil. In an interview about the difficulties of enforcing New York's calorie law, an employee at Nathan's said: "My small fries look like medium fries and my medium fries look like large fries... I figure if they're paying $7 for a meal, people want to get their money's worth. I've got extra bacon in the salads, extra everything." Sorry, this is a shorter list. 1. Because Chain Restaurant Portion Sizes Are INSANE and Most People Are Either Willfully Ignorant, Dumb As Rocks, or In Total Denial About How Stupid Their Choices Are. That's why I think restaurant patrons need those damn calorie counts staring them in the face, however flawed a measurement of nutritional worth they may be. If we were a fit and healthy nation, my opinion might be totally different. But we're not. Nanny State? Bring it on! We don't let drug stores sell hard drugs, even though I suspect if we left it to the free market, they'd be a crack cocaine display at every Walgreens. If we, as a population, are going to act like selfish clueless babies and kill ourselves with gratuitous calories, we indeed need Menu Nannies to at least let us know we're being childish. Since I was too lazy to post more than one reason in support of my opinion that hell yes let's make them put nutritional information on the menus, you may want some additional convincing. As it happens, Lynn of Lynn's Weigh has a similar post with a lot more in the way of actual arguments and research on this topic. And over at Thufferin' Thuccotash, POD has a tale of an evening at Marie Callendar's that's quite amusing. And Hungry Girl has one of those shocking roundups of typical chain meals and how much worse for you they are than you thought. So what do you folks think: should restaurants be required to post calorie counts or other nutritional information? Do you think it would affect your food choices when eating out? I say no. While for me it is a lot of just not wanting to know most times when I eat out my reason is MAINLY because we will thing we are informed consumers when we are not. remember the seinfeld episode about the frozen yogurt? it's all like that IMO. we order the grilled chicken because it has minus 300 calories :) and a line cook doesnt pay attention and dollops butter all over it while cooking and it is now 500 calories. and the consumer knows not. same with McDonalds in that xyz item (lets say the small icecream cone) is 140 calories (Im making this up :)) but they did a study which showed it ranged from that to more than 100 calories MORE depending on the employee creating it. But it has changed my eating habits too know, every once in a while I would stop at D&D and get an iced coffee and a bagel, that's like half my calories for the day, now if I go I get an iced coffee with no sugar and nothing to eat or one of the flatbread sandwiches but most of the time I just get the coffee and eat something at work. Hmmm I'm strangely hungry now, where's my extra gum. as a diabetic, i would LOVE for restaurants to do this! i already have all the fast food places on my favorites, and by now know what i can and can't eat, but in sit down restaurants, i take a insulin/carb ratio dose, and even though i have my handy dandy little Calorie King book in my purse, there's times that i'm off because of something i'm not aware of, or the size/oz, etc. i do agree that it wouldn't be completely accurate due to different cooking styles, but it would at least give some base to start from. then again, this is why i rarely eat out!! I don't think restaurants need to be required to post nutritional info because I think people who want to eat certain things are going to eat them regardless. I have been a foodie most of my awakened life and I know a lot about nutritional info in food. In fact, I think people with weight issues are very knowledgeable on nutrition - often they know calorie counts, fat content because they lay awake at night designing what they might eat the next day on their diets. (speaking from experience). But if it's some special occasion and I want to eat a whole cake, I'd do it regardless except my stomach prevents eating all that much at my ADVANCING age. Also, as Miz said, a food could be one total of calories and Joe line cook decides to pour in an extra half cube of butter and no account was taken for that extra dose of fax. Bottom line is that people will eat what they want and suffer consequences later (or during) the meal. I would like to see the calorie counts on the menu. It might affect what I order or not - depending on the restaurant - but I'd like to have the information available. I would like the calorie counts available, but not next to the price! Calories are one part of the equation and not all that accurate, so why shove it in my face? Have it on the back of the menu or on a website, but I think the ingredient list is way more important than any calorie count information. At last check 2/3 of the United States is listed as either overweight or obese. Obviously the choices being made are not that fantastic and a health hazard to the vast majority. The general public as a whole is stupid and ignorant beyond belief so any posting of nutrition values may help just one. I don't have great faith that this does any good since people still go to horror movies to see someone venerable go into a dark room when the serial killer was last seen there and cringe when it doesn’t turn out so good. I am against it. I think it's a great idea to make the information more readily available but to be forced to place it on the menu next to the price is just wrong. For basically the reasons that you listed but it also comes from a more personal place. Speaking as one of your (probably very few) readers who is living as a fat person, I can say that my life is filled with enough judgment from others about my choices when they see me eating. The last thing I need is the number being right in my face and the face of all those around me making me feel guilty about choosing to eat what I want to eat and giving them more ammunition for the moral outrage at my fat. I take the time to be informed about what I eat, even though admittedly I didn't used to and was horrified to find out things that I thought were probably not that bad were outrageously high in calories, which is why I fully support that restaurants should have that information easily accessible to its consumers. Not just a fixed calorie count either, but a range that accounts for differences in cooks. I like having the calorie information available. It's probably never made a real difference for me because I pay attention to what I eat, so I can make a pretty good guess as to what's what. No. It'll scare everyone away. Then they'll lobby to stop the practice. They'll win. We'll boomerang back to having no nutritional info available. All this aside, very few people really want to know. Most of us live in blissful ignorance believing what we don't know can't hurt us. It's a good, happy place. I like to know calorie information - but only if I choose to. So I think it should definitely be available but either in a separate pamphlet or on the website. On special occasions I think I'd prefer not to know, not to worry, and eat a bit less the following day. I say it's good. Partly because there are people who need to know it, and those who want to know it. In my mind, menus should have (on the back pages) nutrition information, the same as any food you'd get from a grocery store. Hmmm...I think it should be available, but onl if you want it. I was in NY a couple weekends ago, and the calorie count on everything was a bit annoying. I say the more information the better. If people are going to choose the McLardy burger, at least let it be an informed choice, even if the number isn't exact to the nth degree. Maybe put the information underneath the food item in slightly smaller print, so it doesn't stand out. Even if it only helps a smaller percentage of the population, that's still a good thing, right? Several years ago, Ruby Tuesdays did this in our area (posted the calories, fat, etc) right next to the menu item. We had a huge debate about this back when I was in college and they started posting nutritional information on the glass right in front of our faces as we served up our food in the cafeteria. What I found, strangely, is that I just don't feel that strongly about it, one way or another. But of in fact studies can prove that posting calorie counts at chain restaurants makes people modify their choices for the better (and, more importantly, provides an incentive for restaurants to come up with more appealing healthy options), I'm not sure how we can argue against it. I think most of us who would read and comment on your blog already have a semi-decent awareness of just how many calories are in any given meal, and if we really wanted to, could mentally add them up for a rough estimation. What I'd like to know about any food that I eat, is what's making up those calories. If the number is high because there's a lot of protein, carbs and natural fats - or am I eating something that's saturated with a ridiculously high amount of trans fats. I read labels to avoid those nasties. I give in to 0.1 or even 0.2 grams of it on occasion. I'd hate to think I'm consuming 5 grams of it because of some should-be-natural-but-isn't item in the recipe. My son and I went to NYC a few weeks ago and had lunch at the Hard Rock Café, where they had calories listed. I sort of loved and hated it, partly because I was pretty horrified to see what all of the counts were, and partly because it was nice to have an idea. I'm all for it. You can ignore extra information, but it's hard to actually GET extra information if it's not there. I do look up nutritional information when I can, but it's not easy, even on the better restaurant web sites. I don't see that this imposes a huge burden on chain restaurants, which make a pretty standard line of food (it would be different for non-chain places), it's not a costly regulation, and really, what harm can it do? Oh, and I forgot... did you see that Yale study that came out a week or so ago that basically concluded that since most people did not ASK for nutritional information at McDonalds (or wherever they observed... I've forgotten), they did not know or care about it and THUS that there should be counts posted? I'm all for posting the counts, but the notion that because people did not specifically ask for these things, they should be imposed on them is... well, one of the stupidest research conclusions I've seen in a while. I'm torn. But I guess it comes down to this: I don't see *forcing* restaurants to do it, but it sure as hell would be nice to have. I like those that post it under the description (not right by the price). I will frequent a restaurant more often if the info is available. But I also agree that I'd like to see more than just calories - protein, carbs, fats at a minimum. If I'm going to eat fast food, I'm typically going to ignore the counts - it's a treat and I don't care. But at the sit-down (even chain) type restaurants, I plan for multiple meals out of one order so I like to know where I get the bang for my buck. For disclosures sake: I work for a resort company that operates over 68 restaurants - from high end jobs to burger shacks. At my location we recently started to compile calorie info on the things we serve to help our employees. Yeowzers. It is not an easy task. But most of our employees were clueless (as were the cooks). (The first pass had a third cup of sausage gravy listed as 30 calories. Uh-huh. On what planet?) Calories counts given may not be perfect, but at least they provide some level of information. Oy - rambling. It all comes down to: have it *easily* available (preferably *on* the menu). Those that care will pay attention. Those that don't can ignore it. This is a no-brainer. Of course, we should have nutritional information readily available. The law requires labeling of food we buy at a grocery store, so why should it be any different at a restaurant? Given that the FDA does woefully little to supervise and regulate the meat and produce industries, any little bit of information disclosure to us will help us make an informed decision. Of course that doesn't always mean the information will be accurate, but you can say that about any product we buy. That's not a reason to go against nutrition disclosure. Shoot, just recently, a gas chain was busted for selling diesel fuel by mistake. But that doesn't mean that we should stop requiring gas stations to label the types of fuel they sell. Oh dear...did I just compare gas to food? I think they should be required to post them, only because I want to know! There have been several times that I thought it was good for me and it really, really wasn't. Maybe they can have them on hand if people ask for them? If it works, isn't it worth it? Especially considering the obesity rates? At the same time, isn't our government in our business enough? I'm totally ambivalent on this one. "I've got more opinions than the Biggest Loser has product placements." No way! You lost all credibility with this statement. It is not possible. I say it would be nice to have it available online for those who wanted to know. CBC's Marketplace did an episode on this a while back and were amazed at just how many calories were in a lot of menu items in common restaurants (usually 1000+). They also bought meals from places that did list calories on their website and had them tested for content - often the tested numbers were WAY over what the presented numbers were anyways, so I don't know as it would make a difference. It would depend a lot on who made it. I think it's more important to be sure there are healthy meal options on the menu. Then those who want to be healthy (and not just eat a dry iceberg salad) have an option or 2. I guess that I totally don't see this as government interfering with our lives. If the government dictated that you could NOT eat certain foods, etc., then it would be something else. But it a way, this is like cigarette warning labels, isn't it? No one says you can't smoke. But there's a big fat warning that tells you that it isn't a good idea. I absolutely think that the nutritional information should be posted. Even when it is inaccurate (as it often is, since dishes are made my people and not machines), having the information at hand can act as a guideline. Perhaps a compromise for those who don't want to see it would be for there to be some menus that have the info that you just ask for. I LOVE the calorie postings. In NYC, I've already noticed the postings have led restaurants to expand their menus to offer more healthy options. And, consumers are already leaning toward smaller portions. Examples: Starbucks has adjusted their menu to include lower-cal breakfast items like oatmeal and fruit -nut bars. TGI Fridays is offering smaller portioned 3 course dinners for $9.99. I've noticed more folks ordering one or two Munchkins at D&D as opposed to a whole donut. D&D added those flatbread sandwiches to their menu. Restaurants are offering more "snack" size items, too. Government regulations on calorie postings are forcing restaurants to offer more variety & balance. If they are only offering 600 cal items- sales will hurt as more cities list calorie counts. Sure, there will always be people who don't care or complain about it "ruining" their meal. But, those are the folks who encouraged the Super-Sized meals that have plumped our entire nation. Personally, I don't want those people dictating the market. I would rather have reality dictate it. I'm sorry.....but that burger looks wonderful. OMG, I am so bad. That's really interesting, that requiring that the information be posted is changing restaurant practices and consumer behavior. That really leans me in the direction of having this info required, although I'm more inclined to want the information to be available on request instead. In my way of eating, the number that sways me most when dining out are the carbs and sugars first, then total calories. I do a lot of looking up online before going to a chain restaurant, and I have my default items for the more common ones. Sorry if this has already been posted, but with the prevalence of disordered eating out there, I say no. Maybe have a pamphlet available for the people who want it, but for a lot of folks, having calorie counts right in their faces could be a huge trigger. I can understand allergen info, though. That could actually be helpful! I tend to be against government regulation. I'd like to see the government end the war, fix the economy, and patch the potholes. I'd like to see the consumers request nutrition information - and not just calorie counts. We all know the "snackwell" principle - less fat but more calories... So, I like the information but I don't want the government mandating it. Besides, I KNOW how to eat well. That's why if I want to eat well, I eat at home. If I'm going out, it's BURGER TIME! I have mixed feelings as well. I know there are people out there that are clueless even with all the information available online, on the news, on the "entertainment" programs and more. BUT, there are also the ones that just want to pretend that all is fine & continue to lie to themselves. If there was a reputable study that proved across the board that people made better choices when faced with the nutritional values on the menu, I would say go for it. For those of us that already know this stuff, it would just be something to read & we also know that not all restaurants are "truthful" with this info!For others it could help if they want to face the truth. In general, this information is available if you ask the restaurant or online (if you plan ahead).... but some just don't go there. It would not bother me to see it there but I can see how it is an "invasion" to others. I just would like to see anything that would help people make better choices. Naw, not a requirement. I think it could be good business to have the information readily available though. I saw that Seinfeld episode too Miz! Funny stuff! Here in Washington restaurants are required to have this information available. In restaurants it's usually an insert in the drink/dessert menu; in fast food places, it's by the prices. Usually in print I can't really read - and the prices have shrunk too, to make room, which I find really annoying. I'm more than a little disturbed by the comments here about how stupid "most people" (the speaker being automatically excluded, of course) are. As if the only reason someone would choose the more calorific options is stupidity, not because, oh I don't know, they taste good. All that attitude does is reinforce the stereotype that fat people are stupid. And having the information in plain view makes it that much easier for people who are into that sort of thing to judge other people's food choices. "No one is trying to regulate what you order" - except that they are. I'm just shocked at how much contempt there is in this post for people who dare to go to a restaurant and eat what they want. Really? Food with more than X calories is equivalent to crack cocaine? Really? Being an adult isn't about always making decisions other people would approve of. It's about taking the responsibility for the choices you make, and to deal with the consequences. That includes the choice to be uninformed. Or to eat whatever the heck you feel like eating. Part of becoming an adult is learning how to figure out for yourself when you're being irresponsible - without needing someone else to tell you. In fact, not allowing someone to figure that out for themselves is forcing them to be the "child" to the "nanny" you're putting in charge. That seems to me to be the opposite of the intended effect. All that being said, I don't mind having the nutrition info easily available, as long as it's something you have to make a conscious choice to see by turning a page or looking at a particular sign. I do wish there would be more info than just calories, because calories by themselves are pretty meaningless. Ideally I'd like a book (or binder, since menus change frequently) of the same sort of nutrition guides as on packaged food to be available. I think it's wrong for companies to do their best to hide that information, as some do. But I don't think it should be forced on anyone, either. How about posting what kind of antibiotics they pump in their cows? Or whether or not their chickens get sunlight and exercise? Or whether the tomatoes are genetically modified? In my opinion, it speaks volumes about our society that we would demand and legislate that calorie counts be posted on our menus while neglecting much more serious health and ethical issues. If I go to a restaurant and order a couple of chocolate eclairs, the waitress is going to judge me whether the calories are listed on the menu or not. The nice thing about being an adult is you don't have to spend your time worrying about other people judging you. I am so grateful that high school was only four years long. No. I'm with Azusmom on this one: coming from an ED background, seeing the calories posted freaks me out. Ironically, at this point in my life, I'm likely to look up the calorie content online; it's the (totally neurotic and untrue but nonetheless crazy-making) belief that EVERYONE is looking at me and judging what I eat, and that if I have any extra fat anywhereanywhere on my body, I don't DESERVE to eat that burger, or even the salad, but maybe that side salad would be ok, but NODRESSING because someone will wonder why I'm eating more than 100 calories at a sitting, and ohmygod ohmygod ohmygod . . . Please no calorie counts. Hand out pamphlets, post it on websites, whatever, but for the love of God, leave it off the main menu. I seldom get a chance to eat in a restaurant, so I don't really want to know. YES. I think there should absolutely be nutrition information right there. If someone doesn't want to know, then they don't have to look. But we ought to be able to see the information- even if it IS wrong, at least we can have some kind of ballpark! My allergies want the ingredients list! I'm a big fan of the new calorie/nutrition posting laws here in NYC. Now that I track Weight Watchers points, it actually has me visiting a few fast food joints /more/ often than I ever would have considered before. Previously I would have dismissed those places as having nothing worthwhile for me. 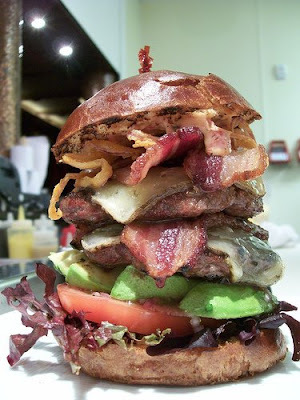 Sure, it's tasty and tempting, but a Baconator or a Nachos Bel Grande is not really part of a balanced diet! I went into Taco Bell a few days after I started Weight Watchers, after the NYC posting law kicked in and discovered that Taco Bell had embraced the law and were also highlighting several selections that were very "points-friendly." I now have a Fresco Crunchy Taco or two (3 pts each) with a salad (veggies only + my own healthy dressing) for lunch on occasion and I enjoy it so much I feel like I'm "cheating." Would I eat that every day? Certainly not. But it's a convenient option every now and then when I am rushed for lunch. At Wendy's I discovered that while I still can't justify a Baconator, chili, a salad with my own dressing and low fat sour cream & chives potato is tasty and satisfying. Of course, I know in theory that removing cheese and the high-fat sour cream from a meal goes a long way toward making it "healthier", but I wouldn't have believed that those palces had reasonable choices for me. I would have assumed the points value was much higher than it is. By providing me with nutritional info, Taco Bell and Wendy's are making more money from me now, rather than losing a customer, which is what they (and I) feared would happen. As a sidenote, while I appreciate the calorie count law, I wish that it went even further. Posting calories along with fat, fiber, protein and sodium would be a huge improvement. As of now, I still visit the restaurant's website to find this info because it's often impossible to locate it at the counter (or printed in such tiny lettering it's impossible to read). If I'm ordering something new, I whip out my iPhone and visit the site while I am on line so i can be prepared when I get to the register. Knowing that something is 300 calories is nice. Knowing that those 300 calories contain like 18g of fat and 600mg of sodium gives you a much different picture of what you're eating (or not eating). Wow that's one darn heart attack sitting there. I call it blood clot. I think the longer NI is required on menu items, the more people will get used to it, just like we did with nutrition labels on every food item in the store. You can choose to ignore it or you can choose to read it. Even if the info isn't completely 100 percent all the time right, I'd be willing to bet that most of the time it would be pretty close. It's just information, folks. The more the better, I say. I don't care whether they do or don't... but Cranky I'm with you on those bloomin onions. Once in a while having one is like being in hog heaven! I think there is a big different between the government forcing businesses to do things and the government forcing regular Janes and Joes to do things. I think regulations that keep our food supply safe, for example, are good things! Regulations that keep cigarette companies from targeting children with their ads, etc. We need protection from businesses in my opinion. More, even, than we have now perhaps. Nutrition labels on foods we buy at the grocery store are nothing but helpful. People can ignore them or not. What's the big difference with eat-out food? I say, knowledge is power. Ignore it if you want. It's jarring right now because it's brand-new but pretty soon those who want to ignore it will be able to tune it out, just like they do with nutrition labels. That's their right and these regulations are not taking away any consumers' rights, IMO. I think I have a right to know what I am eating. If you don't want to know, then ignore it. Why is that so hard? I used to think I would love having calories on the menu. But truly, if you eat out, you really have no idea what calories you are getting. Most of the time, published counts are underestimating, if anything. I'm beginning to think the answer is just to eat smaller portions and make the healthiest choices I can. And be willing to ask for healthy alternates. Even at chain restaurants, they are usually willing to accomodate if you ask for extra veggies instead of a potato. And they are willing to bring dressings and toppings on the side. OTOH... I would've made a different and better choice a week or so ago if the calorie info had been right there handy. I had no idea that the calories on an omelet could vary so much! This also seems to be true with salads as well! Whether I actually would've gotten fewer calories, I don't know. Perhaps having the calorie counts available in a brochure on the table with the "specials" would be a way to have the info present, without it being on the menu. At any rate, living in a small town, I've not yet seen calories listed on any menu. Perhaps I'll feel differently when actually confronted with the fact. After reading just the title, this was going to be a short comment of no, simply because given that I don't go out to restaurants often, I just want to enjoy my meal. But after seeing the burger in the picture I realised what restaurants you are talking about. I make the assumption that most people know that not much healthy stuff comes out of a fast food restaurant and therefore should not be treated as a regular place to eat, but an occasional treat. So would it achieve anything for most people? I doubt it. I find it annoying trying to keep within a calorie budget when I go to a restaurant and find they do not list the calorie count on their meals. I still take my meal there but after today I will leave the restaurant if they do not list their calories. It is not about being nannied. I am trying to control my own diet but as a single adult I do not have the time to spend 30 min to an hour preparing meals. Even so proper nutrition is not taught anymore, not at home or at school. I have no idea how to prepare a healthy meal that is low in calories. I am slightly over weight and have been surprised since counting calories (to lose it) how often people consume an entire days worth in one meal.